The Federal Reserve is 99% likely to raise interest rates Wednesday for the first time in years. That's almost a sideshow. What Wall Street will really be watching for are hints about what's coming in 2016. How many more times is the Fed going to raise rates? Investors around the world will be counting how often the word "gradual" (or something like it) is used in the official Fed statement that comes out at 2 p.m. and then at Janet Yellen's 2:30 p.m. press conference. "I think Janet Yellen will give us one of the most dovish press conference ever," says Ed Yardeni, president and chief investment strategist of Yardeni Research. The message is likely to be: Yes, we raised interest rates today, but we will be very slow and cautious going forward. Expectations were already high for Yellen to stress that the Fed would "go slow" in 2016, but investors are even more anxious after the junk bond market scare in recent days. A big junk bond mutual fund called Third Avenue blew up last week. Investors want to hear that the Fed is watching these alarming developments and will react to prevent another crisis. 1. How many times are "gradual" and "accommodative" said? In recent weeks, Yellen and other Fed members who get to vote on interest rates have been stressing that they aren't in a rush to do more rate hikes after the first one. "Of course, even after the initial increase in the federal funds rate, monetary policy will remain accommodative," Yellen said earlier this month. She even used the word "gradual" later in her speech. Any deviation from that message will alarm Wall Street. 2. How many Fed members vote AGAINST the rate hike? There are 10 Fed members who currently vote on what interest rates should be. Typically, all 10 members vote the same way or, at least, 9 of the 10 do. But this rate hike is expected to be somewhat contentious. There's speculation on Wall Street that at least two Fed members will dissent this time. If it's more than that, investors will read it as a sign that the Fed will go even slower in 2016 than expected. 3. What does the "Dot plot" say? In an effort to be more transparent, the Fed puts out charts showing its forecasts for the economy in the coming months. There are projections for growth, unemployment and inflation (how fast prices go up). But the key chart to look at this time is the so-called Dot plot. It's where each Fed member gets to put 1 black dot on where he or she thinks interest rates will be at the end of 2016, the end of 2017 and the end of 2018. The last time the Fed released these charts in September, the projection was that interest rates would end 2016 at 1.4%. That's a lot higher than the 0% to 0.25% range rates are currently at. "I think the Fed will raise rates dramatically less than the Dot plot implies," says Ben Laidler, global equity strategist at HSBC. The expectation is that the Dots are going to come down. If the estimate stays at 1.4%, that implies more rate hikes than Wall Street wants in 2016. 4. What worries the Fed? Once the initial scan of the statement and charts is done, attention will turn to an analysis of what the Fed thinks the economy's biggest problems are. In September, the Fed talked a lot about China and the global economy headwinds. But those concerns weren't as big of a part of the October Fed statement. 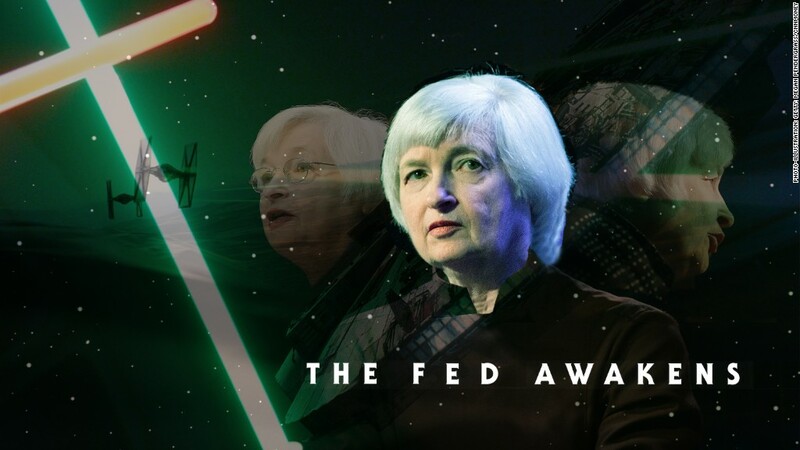 What's on the Fed's mind for 2016? Is it still China? Is it the junk bond scare? Or is it the stubborn lack of inflation in the U.S. economy? Inflation is running well below the Fed's 2% target. Getting clarity on the Fed's biggest fears helps investors understand what needs to improve for the Fed to raise rates more next year.